Melt inclusions (MI) trapped in igneous phenocrysts provide one of the best tools available for characterizing magmatic processes. For example some MI experience post-entrapment modifications and to return the MI to its original state laboratory heating may be required. This is followed by rapid quenching to produce a homogeneous glass phase so that microanalysis can be undertaken. In their paper “Application of the Linkam TS1400XY heating stage to MI studies” published in the Central European Journal of Geosciences, the team at Virgiania Tech including Esposito.R , Klebesz.R, Bartoli.O, Klyukin.Y.I, Moncada.D. & Doherty.A.L, and Bodnar.R.J. describe a series of heating experiments that have been performed on crystallized MI using the Linkam TS1400 heating stage. The TS1400 stage has a ceramic heater that completely encases the sample in a uniform temperature controlled environment enabling high accuracy control up to 1400°C within a gas sealed chamber. A special manipulator enables rapid transfer from the heater to a colder platform for ultra fast cooling rates of up to 240°C per second. 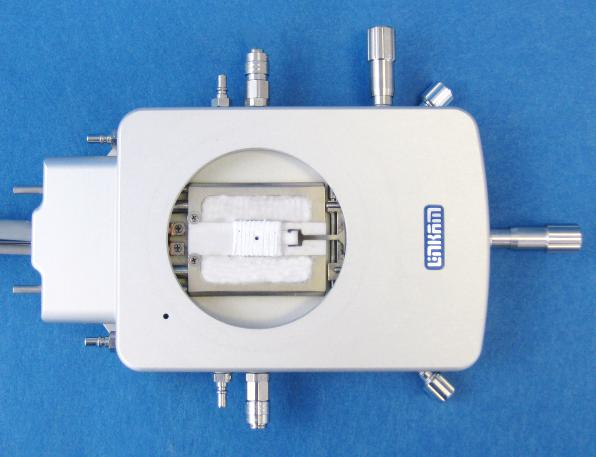 The Linkam TS1400 StageThese tests demonstrate the applicability of the Linkam TS1400 stage to heat and quench the MI to produce homogeneous glasses that can be analyzed with various techniques such as Electron Microprobe (EMP), Secondary Ion Mass Spectrometry (SIMS), Laser ablation Inductively Coupled Plasma Mass Spectrometry (LA ICP-MS), Raman spectroscopy, and FTIR spectroscopy. Linkam would like to say a big thank you to Robert Bodnar and his team for all their help over this year. Older PostLinkam temperature controlled warm stages chosen as a reliable temperature control solution for the assessment of sperm motility in human fertility testing.